Tom Brady does an interview after the Patriots win Super Bowl LIII. 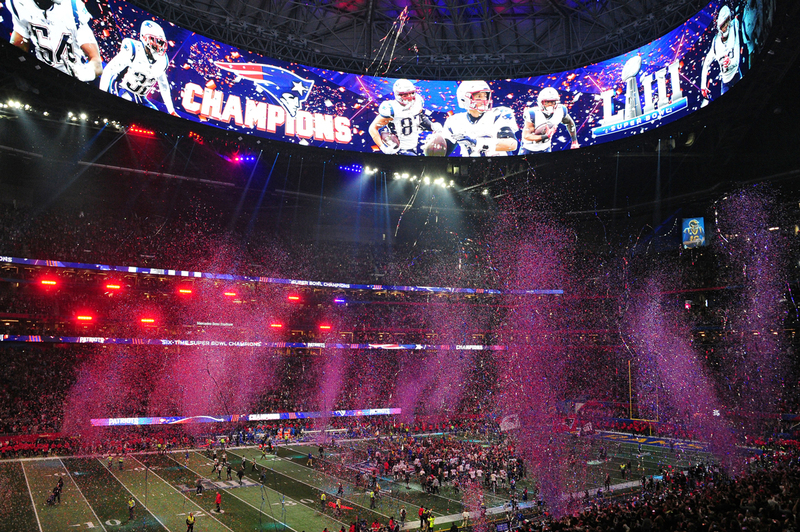 As the final shards of Lombardi Trophy-shaped confetti twinkled around Tom Brady on Mercedes-Benz Stadium’s field, and New England Patriots fans began their march to the Hyatt Regency on Peachtree Street to greet the victors, many Atlantans realized what fans of the Los Angeles Rams certainly had already internalized—Super Bowl LIII just wasn’t that good. It’s safe to say that Atlanta was far and away a Rams town on and leading up to Sunday. 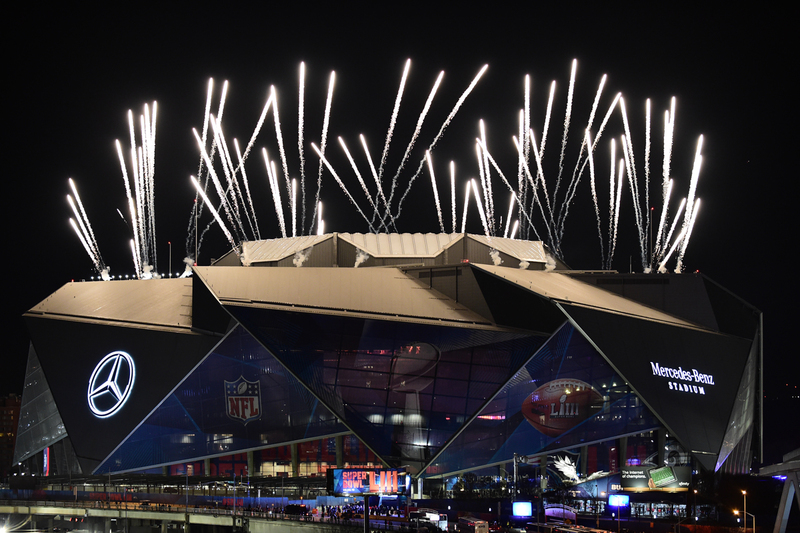 The city was cheering for the West Coast team after the NFC Championship game put an end to the thought of a New Orleans Saints Super Bowl—the arch rival of the home team Falcons—in Atlanta. 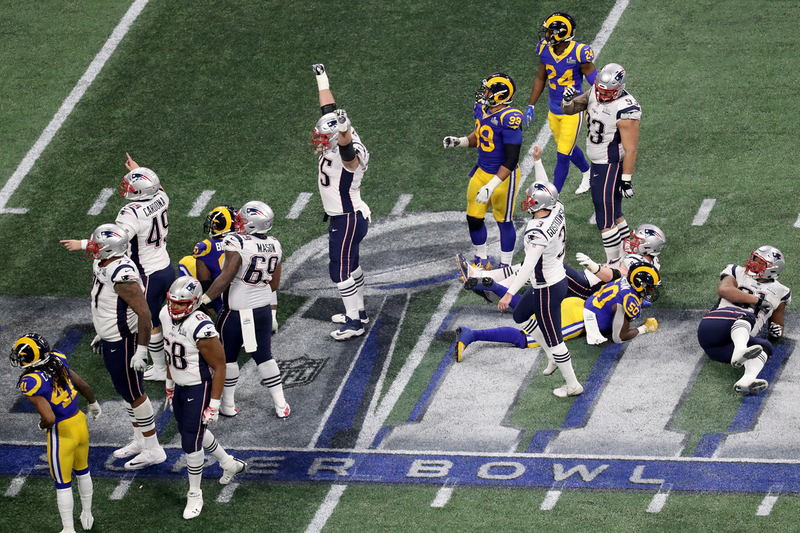 Then there was the fact that the Rams were decidedly not the Patriots, who just two years ago were able to overtake the Falcons’s 28-3 lead to win Super Bowl LI. Perfectly represented in the stadium on game day, concessions workers overwhelmingly joined Rams fans in cheering as L.A. took the field. 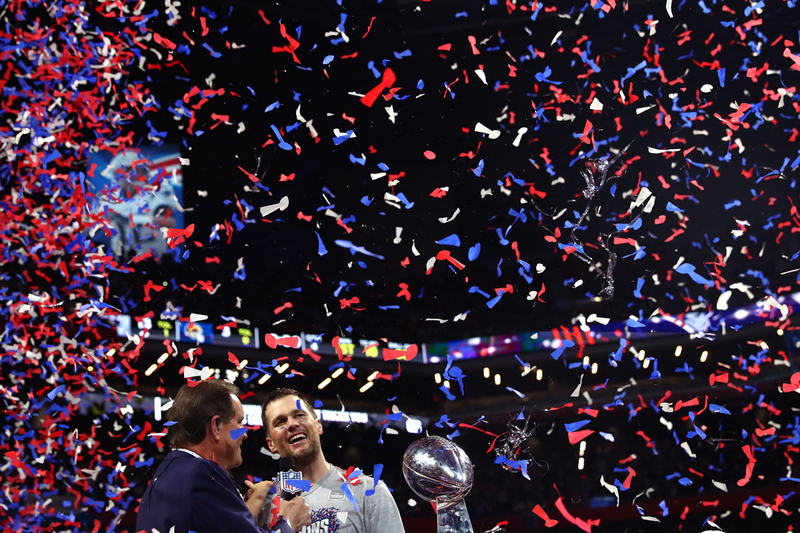 But Rams supporters were dwarfed by the sheer volume—both in number and loudness—of New Englanders, many of whom took the trip down the coast to see their franchise earn an Infinity Gauntlet’s worth of Super Bowl rings. 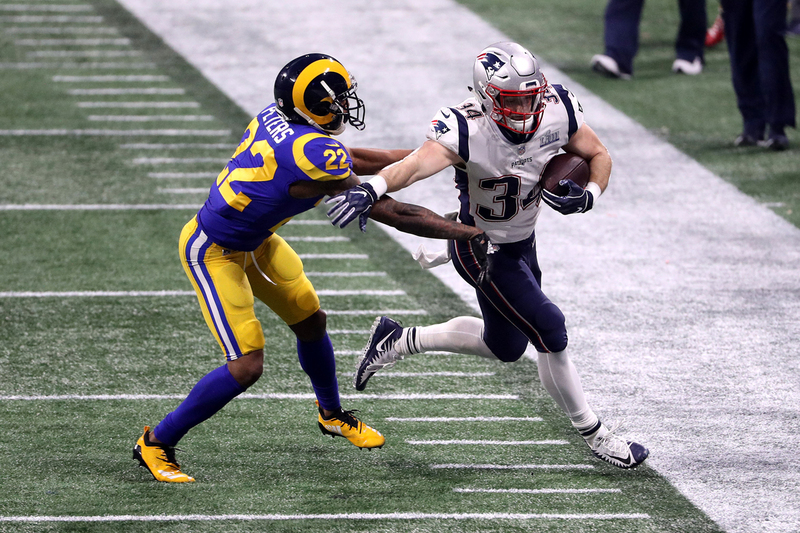 Rex Burkhead of the Patriots carries the ball against Marcus Peters of the Rams during the second half. For most of the 60 minutes of play, Super Bowl LIII was an exercise in watching paint dry. Despite moments of offensive power, both defensive units regulated the game. Brady threw an interception that the Rams couldn’t capitalize on. Stephen Gostkowski missed a field goal for New England. Punt, punt, punt, repeat. The only points from the first half came from Gostkowski’s redeeming 42-yard kick in the second quarter, making it 3-0 going into the Maroon 5 halftime show. Only Super Bowl IX, between the Pittsburgh Steelers and the Minnesota Vikings, had a lower halftime score: 2-0. Maroon 5’s show opened with an impressive display of fireworks, but the bursts of pyrotechnics would become a symbol indicative of the show—a quick flash in the pan and an uncomfortable amount of lingering smoke. Appearances by Travis Scott and Atlanta’s own Big Boi livened up the performance, but with each only on stage for roughly 90 seconds apiece, neither rapper was utilized enough. Combined with Adam Levine’s continued disrobing, the entire set was about as coherent as a peanut butter and mayo sandwich, though without the surprising sweet taste; a forgettable moment in a forgettable game. Lumbering through the third quarter, both teams punted twice. Los Angeles kicker Greg Zuerlein hit a 42-yard field goal late in the quarter to tie the game 3-3. 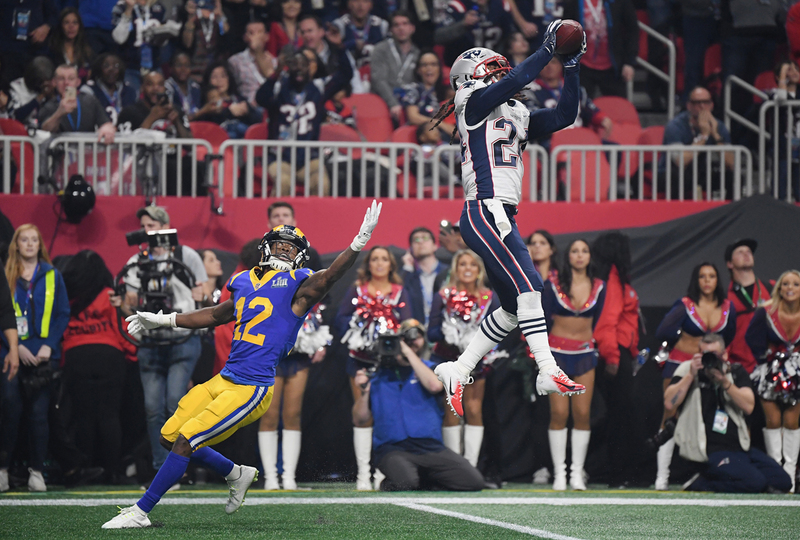 Patriot Stephon Gilmore makes an interception in the fourth quarter. The Patriots celebrate their 41-yard field goal in the fourth quarter. With just 15 minutes of game time remaining, and with any score potentially being the go-ahead for a win, you’d think both teams and their fans would be foaming at the mouth. Instead, the atmosphere was more reserved and the fervor chilled. It wouldn’t be until the middle of the fourth quarter that the crowd would awaken from their fan-first-pricing-induced food comas. Brady flew his offense 67 yards down the field to the Rams’s second yard line. Then, with seven minutes left in the game, the New England Patriots scored the very first touchdown. Rams fans checked back in, out for blood, as Jared Goff returned the favor and took his team to New England’s 27-yard line. On the next play, he threw a pick marked by Patriots fans’ cheers and presumably laughter from the direction of Louisiana. The Patriots would run down the clock, kick another field goal for insurance, and watch as Zuerlein missed step one in the Rams’s last-ditch efforts to steal a win. Imagine if instead of a 13-3 punt-fest, we had Drew Brees and Tom Brady competing directly for the title of the G.O.A.T. Consider the anguish of Atlantans, who would have had to choose between rooting for the team that came back from 28-3 or their ultimate rival. Either team losing would have given Falcons fans plenty of new snarky retorts—meaning Atlanta fans would have won either way. Envision Bourbon Street driving itself just seven hours up to Peachtree Street, surely pumping in more dollars to our economy than Los Angeles did. From whatever angle you look, it was just the better story. Atlanta did everything right; we put on a hell of Super Bowl. It’s a shame we didn’t get the game that would have lived up to it. It could soon be legal to harvest oysters in Georgia—but why is the proposed law so murky? Atlanta’s LGBTQ powerlifting club builds bonds by pumping iron. Meet the Fantastic Beasts. Buddy Pittard believed every death row inmate deserved his fate. Then he met Keith Tharpe. The Legends are Atlanta’s new pro football team. But will their league survive to see a second season? Since 1961, Atlanta magazine, the city’s premier general interest publication, has served as the authority on Atlanta, providing its readers with a mix of long-form nonfiction, lively lifestyle coverage, in-depth service journalism, and literary essays, columns, and profiles.